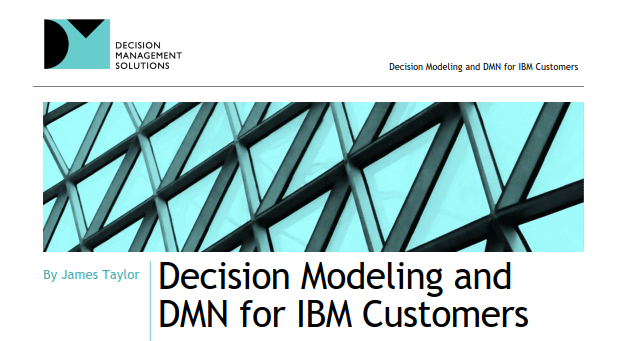 We have a new Leading Practices brief available – Decision Modeling and DMN for IBM Customers. IBM has long been a leading player in business rules management systems and Decision Management Solutions has many customers using IBM Operational Decision Manager in North America and Asia. Our DecisionsFirst Modeler software decision requirements modeling using the Decision Model and Notation (DMN) standard and has long been integrated with ODM using an open API to link decisions modeled in DecisionsFirst Modeler directly to the rules in ODM that implement each decision. IBM customers looking to use graphical decision requirements models have a new choice in December, 2018 when the new Decision Composer capabilities (described in this Decision Composer First Look on JTonEDM.com and this IBM Developer blog post) will be made available as part of Decision Center, ODM’s business user environment. Today users can access Decision Composer standalone but when it becomes part of ODM Decision Center it will be widely available to all ODM Decision Center users. ODM customers considering Decision Composer should use DecisionsFirst Modeler, the DecisionsFirst approach and ODM/Decision Composer in combination to maximize results. DecisionsFirst Modeler let’s you stay focused on the business problem, not the technology, supports the integration of analytics and AI with your business rules, supports multiple user perspectives and manages the decision requirements process. 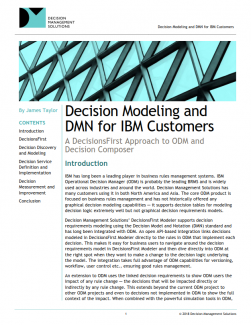 Download our new brief – Decision Modeling and DMN for IBM Customers – outlining how the approach, DecisionsFirst Modeler, ODM and Decision Composer can be used to complement each other. If you are using ODM and/or Decision Composer and would like to see how to apply our DecisionsFirst approach to improve your rules projects, contact us. Next Post 80% of insurance carriers aren’t delivering high impact analytics. Here’s how you can do better.